Schaumburg, IL - February 3, 2009 Acresso Software, the makers of InstallShield and AdminStudio, today announced InstallAnywhere 2009, the latest version of the leading multi-platform installation authoring solution for software producers. The new release improves automation and customization options for better installation experiences that are consistent across all their supported platforms. InstallAnywhere 2009 further streamlines the installation development process through capabilities such as an automation interface, and improves reliability in the field by providing greater control over rules applied across target platforms. The result is cost savings in multiple phases of the product lifecycle. New APIs improve automation and extensibility—The new APIs enable developers to programmatically create, edit and build their installation projects, streamlining both existing and new projects. Additional APIs enable conditional logic to be utilized during the installation for higher reliability. Automated search for existing Java Runtime Environments—A new search algorithm automatically determines if a specific Java Runtime Environment is already installed on a target machine, increasing accuracy and installed product stability. 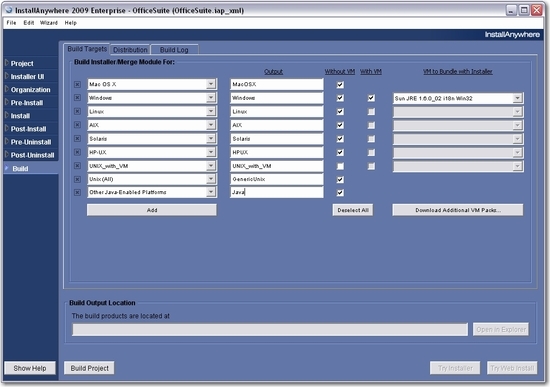 Greater customization of the end user installation experience—New customization options allow software producers more control to produce a unique, professional installation experience. Improved uninstallation—Additional capabilities enable the installation developer to control and customize the uninstallation actions and error handling, reducing customer support calls. InstallAnywhere is the successor to the discontinued InstallShield Multi-Platform (ISMP) product, and many of the capabilities new in InstallAnywhere 2009 are targeted to customers interested in migrating. InstallAnywhere supports the broadest range of technology platforms in the multi-platform installation industry, including Unix, Linux, Windows, Mac, and i5/OS. InstallAnywhere 2009 now offers support for these versions: Windows Server 2008, Windows Vista, Java 1.6, Mac OS X 10.5 (Leopard) and more. Whether developing software for traditional deployment or new Web-based or SaaS-based deployments, InstallAnywhere provides an easy-to-use, powerful, and flexible installation tool that allows multi-platform developers to more quickly bring their single language or multi-lingual software products to market. 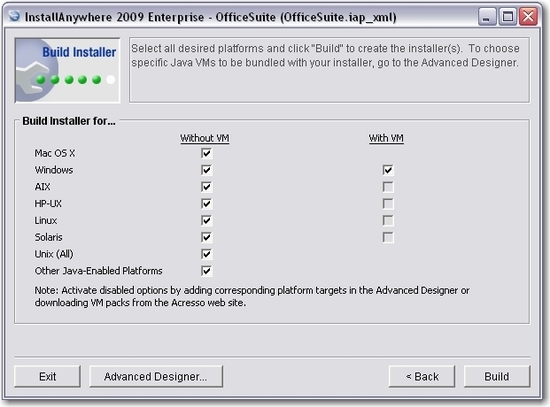 Availability and Licensing: InstallAnywhere 2009 is available immediately. InstallAnywhere can be purchased by single license or as a concurrent license, which is ideal for large engineering teams whose members will only use it during selective intervals. Top ISVs such as IBM, Oracle, Computer Associates, EMC and others use InstallAnywhere to install their Java-based applications. Visit InstallAnywhere to view online demos, download the free evaluation, and read success stories. Roger Bottum, Senior Vice President of Marketing for Acresso Software: "At Acresso, we have been setting the industry standard for installations for almost thirty years, and today we are drawing on this experience and knowledge to introduce InstallAnywhere 2009. In this tough economic climate, as software producers are looking to reduce their costs and those translated to their customers, InstallAnywhere 2009 can help not only decrease development time, but can create higher quality installations. With 35% of support calls related to installation-related issues, by improving installation reliability, InstallAnywhere can help reduce technical support costs and improve customer satisfaction."